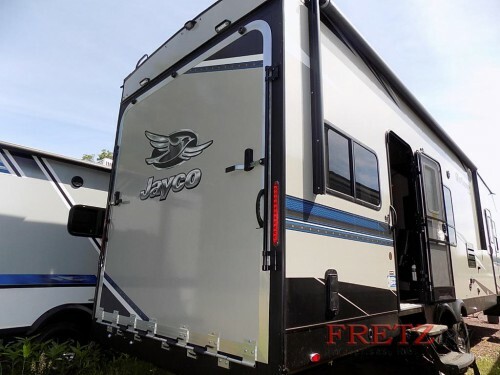 Check out our Jayco Octane Toy Haulers! The key feature that sets a toy hauler like the Jayco Octane apart is the rear garage. With the Octane, you can get up to 16’ of cargo space for hauling outdoor toys such as dirt bikes, ATVs, kayaks, bikes, and more. The rear ramp doors comes with a 2,500 lb capacity to make loading and unloading even the heaviest gear a breeze, and with non-skid flooring, you can ensure that everything is safe and secure. Load and unload your toys with ease on the rear ramp door leading to the convenience cargo space. 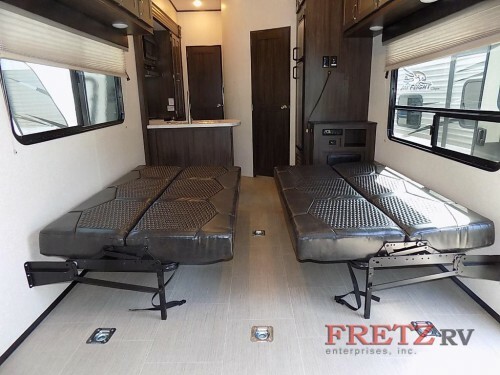 The amazing thing about most toy haulers is that the rear cargo area usually comes with a convertible feature to make it a liveable space once your outdoor toys have been removed. For instance, in the 2019 Octane, you will find a Happi-Jac bed and sofa combo to make not only sitting space during the day but also extra sleeping space at night. This plus the king sized private master bed will give up to eight people a comfortable place to call their own. With more interior space and items for additional fun, you can enjoy both comfort and adventure. The extra fun with a toy hauler comes from more than just the ability to bring your toys with you. Items such as the 40 gallon fuel station lets you have extra gas to keep all of your fuel tanks full! And for those who enjoy a slower form of fun like reading or napping, you will love the 20’ electric awning with LED lights that will provide a shaded area away from the sun and weather. 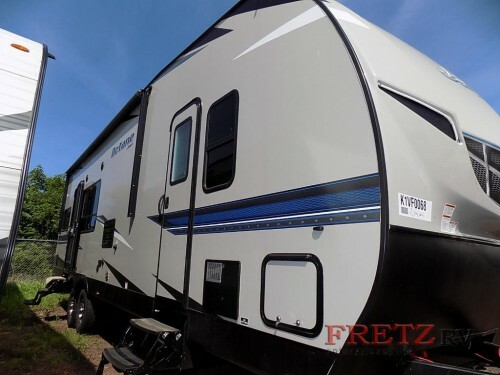 If you truly want to enjoy the best of both worlds, be sure to take a look at our toy haulers like the 2019 Jayco Octane. To find out more ways you can take your RVing life to the next level, be sure to contact us or stop by our location today!